Boston, September 23, 2013, –This past weekend, Michelle Wu, candidate for Boston City Council At-Large, campaigned in Dorchester, Roxbury, Roslindale, Jamaica Plain, West Roxbury, the South End, Beacon Hill, Mission Hill, Allston-Brighton, and West Roxbury in advance of the preliminary election on Tuesday, September 24. Michelle Wu rallying supporters at the get-out-the-vote Canvass Kickoff in Jamaica Plain. Saturday morning, Wu attended the Mothers for Justice and Equality Breakfast in Dorchester, met business owners and residents in Roxbury with District 7 City Councilor Tito Jackson. 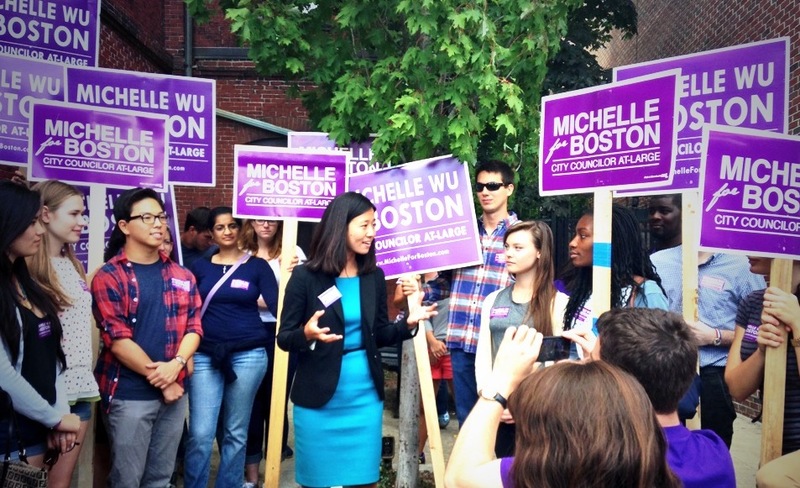 Saturday afternoon, Wu kicked off a GOTV rally and canvass at JP Licks in Jamaica Plain. Saturday evening, Wu knocked doors in West Roxbury, then met patrons at Darryl’s Corner Café in the South End. Sunday morning, Michelle Wu attended the Beacon Hill Civic Association Annual Pancake Breakfast and knocked doors in Mission Hill. In the afternoon, Wu greeted runners at the Honan 5k race in Allston-Brighton and marched in the Allston-Brighton Parade. Wu attended a house party with supporters in West Roxbury, Sunday evening to end a busy weekend.